Spring has arrived and that means we are spending a lot of time in the schoolyard after the bell has rung. I am always looking for easy to make and healthy after school snacks. The kids are so hungry at the end of the day…they need a good snack. Our old standby is fruit slices, but I was looking for something more. 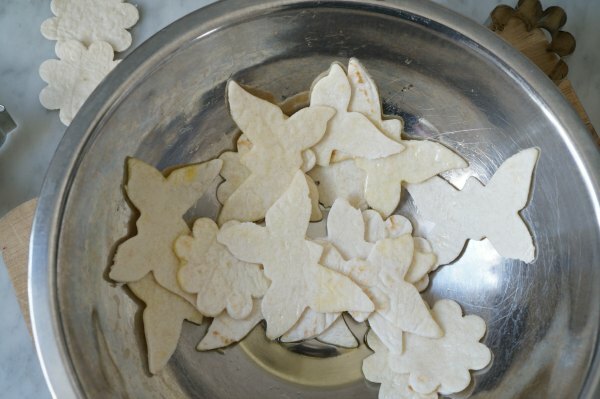 So, I pulled out the spring themed cookie cutters and a pack of tortillas and made a batch of springtime homemade tortilla chips. 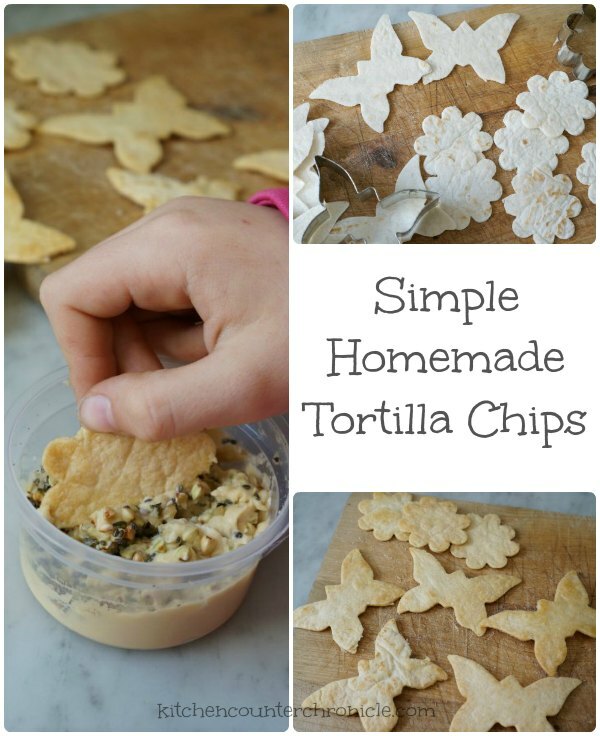 Using a spring shaped cookie cutter, cut out tortilla chips from the tortillas. Tortillas are harder to cut through then cookie dough, so you might need to use a sharp knife to cut out the fine details. 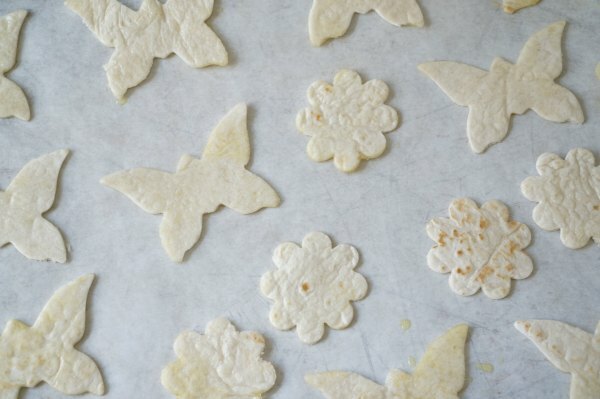 We used flour tortillas, but this recipe works for corn tortillas as well. I chose a butterfly and flower cookie cutter, but you could use any shape that reminds you of spring. Next, toss the chips in a bowl with 2 tbsp of olive oil to lightly coat both sides of each chip. Arrange the chips in a single layer, on a parchment paper lined baking sheet. Sprinkle with a little salt. Bake in a 350°F oven for 5 minutes – turn over and bake an additional 5 minutes. The chips should be lightly golden and crisp. Remove from the baking sheet, let them cool and enjoy. These light and crispy chips are super versatile. They can be eaten on their own, dipped in salsa or hummus. They make a perfect healthy after school snack. We have been enjoying our tortilla chips with President’s Choice’s new Buckwheat, Chia & Hemp Mini Hummus. 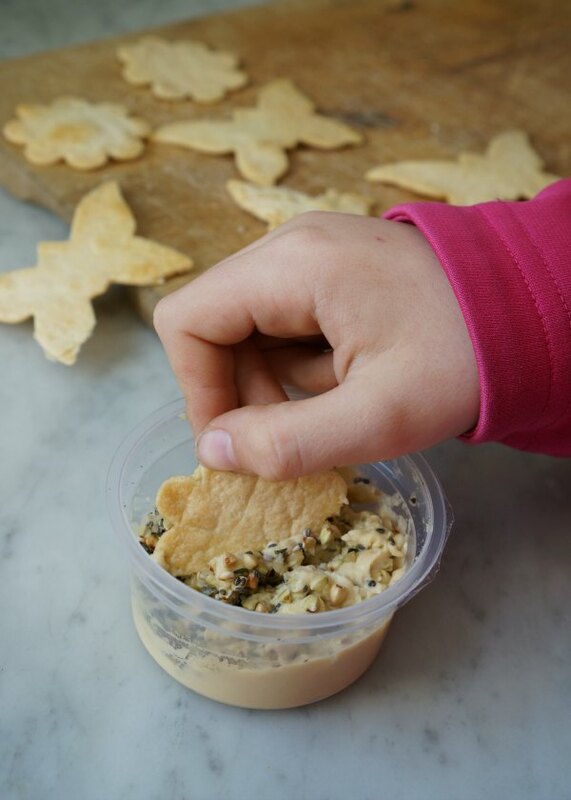 My girls love the added crunch of the seeds with the creamy hummus. I am super excited to offer this cross-Canada giveaway to you. Pick up a pack of tortilla chips and check out all of President Choice’s new spring products with $75 President’s Choice giftcard. The giveaway will close in one week – Wednesday, May 6th. Entrants must be a resident of Canada, however those in Quebec are unfortunately unable to enter the giveaway. Good Luck! Be sure to subscribe to Kitchen Counter Chronicles to have our kid activities, fun crafts & family friendly recipes delivered directly to your inbox. You may also like to follow along on Facebook and Twitter. 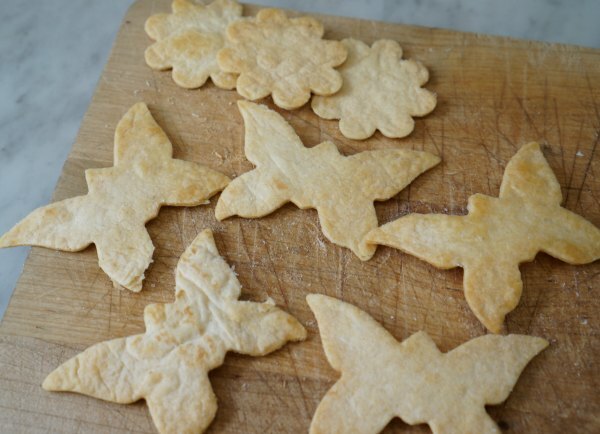 Looking for more fun family food inspiration? Check out our Family Food & Recipe board on Pinterest. Green Onions! Love them for a side, cooking in salads. A favorite ingredient for cooking & baking is fresh mint that I grown in the garden! I like to cook with fresh tomatoes! 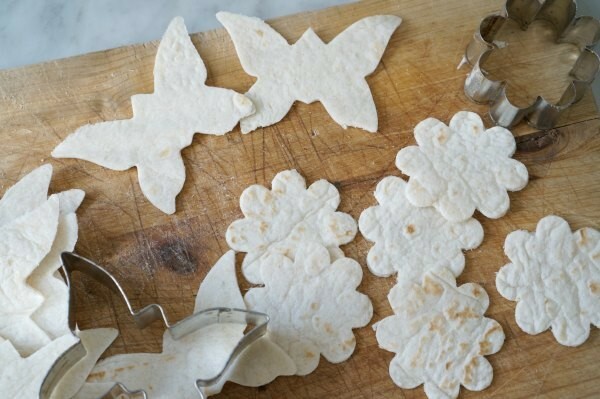 I never would have thought of doing that with tortillas, looks fun! My favourite spring ingredient is hummus (ok not really and ingredient) but I love spreading it on sandwiches and using it for dip on nights when we’d rather get outside than cook. My favourite spring ingredient is steak since we don’t eat it in the fall/winter months. When we get the BBQ ready it is time to start cooking steak! Great idea with the tortillas! Peas! Fresh in season peas are great, add some butter and you are good to go! My fave Spring ingredient is tomatoes. In salads, in pasta, in sandwiches, on bbq burgers, in fresh salsa and on pizza! My favourite spring ingredient is fresh grown herbs from my garden. I grow my own watercress, coriander and such. They add so much flavor and scent to stir-frys. My favourite spring ingredient is fresh salsa with tortilla chips, yum! My favourite spring (summer-ish) ingredient is fresh berries! I love going berry picking then coming home and making yummy desserts or jam with the berries! There is nothing better than in season fruit warmed by the sun! my favorite springtime ingredient is strawberries. My fave spring ingredient would be Chives! They are up and Ive already snipped at them quite a few times. I really love them in a loaded baked potatoe or my garlic smashed potatoes! My favourite spring ingredient is….asparagus! and all those lovely greens. I am totally going to make these for my kid’s lunches. They will be starting to stay for lunch next week, and they both dislike sandwiches! Thanks for the awesome idea! I love any fresh fruits as spring ingredients in my meals in the spring. It just makes me feel better to eat some fruit straight from the farm. My favorite springtime ingredient is mint. I have so many uses for it from food to drinks and smudge sticks. My favourite spring time ingredient is definitely asparagus. So delicious and tender. My favourite spring ingredient is local fruit – we are so lucky to have such an abundance of it! My favourite spring ingredient is fresh fruit – wild strawberries being the best of the best. My favourite spring ingredient is rhubarb. My favorite spring ingredient is some fresh basil! Cream cheese is my favourite ingredient. Strawberries are my favourite spring ingredient. My favorite spring ingredient is chives. I can add them to so much and they come up early. Happy Spring! Strawberries, everyone in my family loves them and there are so many great ways to use them! My favourite is Asparagus and Rhubarb, they are the two best Spring foods!! My favourite spring ingredient is asparagus. It’s delicious and works in so many recipes that you’d never expect! My favourite ingredient would have to be strawberries!